Skip the vodka and rum and go straight to the good stuff. Champagne adds a nice, mild flavor that’s not too strong to the fruit, while the fruit adds a sweet kick to the champagne. Once you are ready to serve it, you can take the fruit out of the champagne, put ice in glasses and pour the liquid over the ice, creating a fruity wine. We used the strawberries to top a cheesecake and drizzled just a little champagne over the top. It’s also a great tailgating dish. Wash all your fruit and place in a 10 cup plastic container. Slowly pour champagne over the fruit. Gently mix. Refrigerate at least 12 hours or overnight. Very different twist on the usual vodka angle. Oh yum. I am trying this for our next Wine Wednesdays get-together at my friend's house. Wine Wednesdays is a bunch of women who gather each Wednesday evening to drink wine, eat whatever everyone chooses to bring, and catch up on our lives during the week. This is the perfect recipe for it. 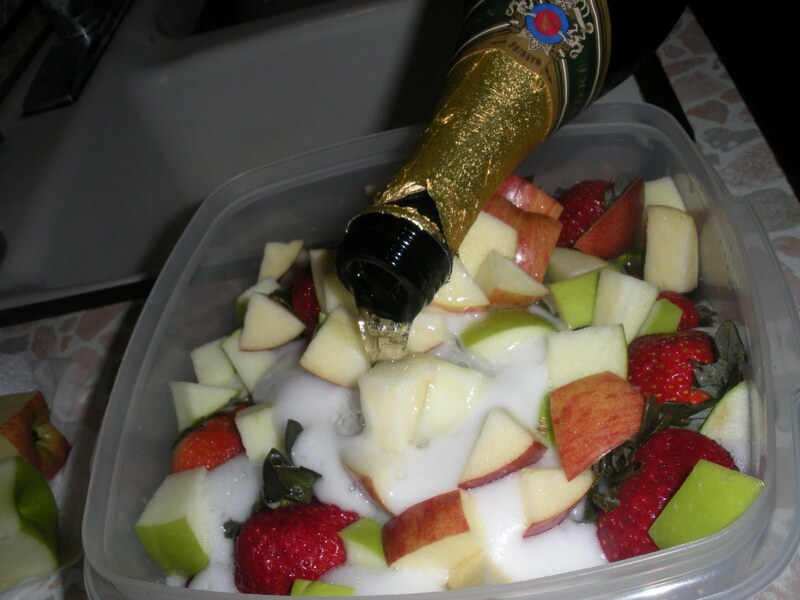 Nice to see someone else use alcohol in their fruit salad. I always use Amaretto, but the champagne sounds yummy. Will have to give that a try next time.